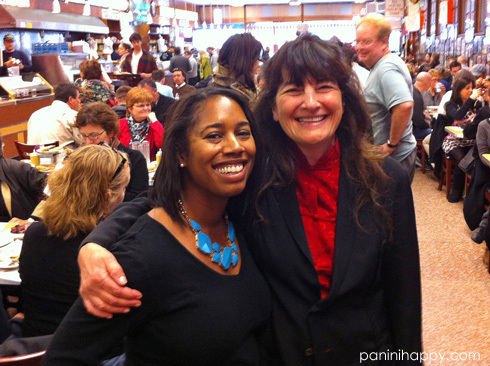 There was no containing the excitement I had over the opportunity to spend a morning exploring the Lower East Side of New York City with Ruth Reichl. A lucky group of about 25 of us, in conjunction with last week’s IACP (International Association of Culinary Professionals) conference, joined the iconic Gourmet editor and food writer to experience the rich history of this area of Manhattan come to life through food. The Lower East Side tour – I’ll tell you all about it in a minute – was just one of a myriad of “wo0 hoo!” moments I had on this packed, whirlwind New York trip. I could go on for post after post about meeting Sara Moulton and getting to tell her that Sara’s Secrets was the first cooking show I ever watched regularly, trying and liking my first bone marrow on toast at Prune (and seeing Top Chef Masters winner Floyd Cardoz there too! ), touring the test kitchens at Food Network and Bon Appetit, spotting Jacques Pépin in the hotel lobby and Wolfgang Puck across the street at Good Morning America, having an amazing Ethiopian meal up at Massawa near Columbia University with my local Manhattanite friend Rachel followed by a forty-block walk back down to Momofuku Milk Bar for a slice of their famous crack pie (oh yes, it’s addictive!) – but how about I just share the details on the Lower East Side tour, which was probably my favorite highlight of them all. Our tour, expertly led by Jeff Albucher of Aroma Cucina and Mitch Weinstein of Tasty Travails, started out on Houston Street at Russ & Daughters. Mark Russ Federman, whose grandfather first sold herring via pushcart in the early 1900s, spoke to us about the family-run appetizing shop. “Appetizing”, I learned, is a Jewish food tradition that’s particularly local to New York City. At one time there were appetizing shops – purveyors of smoked and cured salmon, homemade salads and cream cheeses – all over the city. Today, this kind of business isn’t as economically viable and so Russ & Daughters is one of the last of its kind. Ruth shared poignant childhood memories of making trips to the shop with her grandmother. I sampled the incredible whitefish salad, which Mark innovated back in the 1970s, along with my first herring! 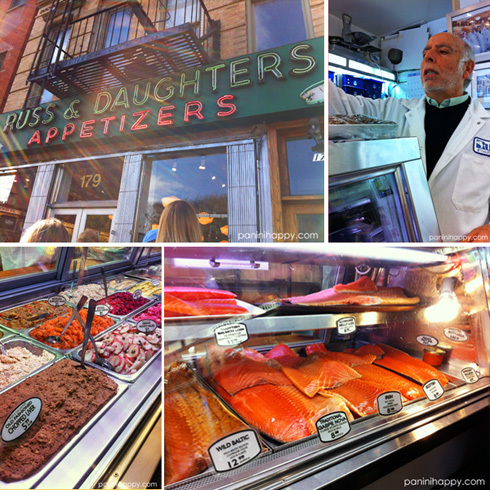 Just before we left Russ & Daughters, Mark Russ Federman advised us that the herring, salmon and whitefish we’d just sampled were the types of foods that the Jewish immigrants living in city tenements in the late 1800s would have eaten. That detail really brought history to life for me, as I climbed the creaky stairs and walked down the dark halls of the tenement building at 97 Orchard Street that comprises the Tenement Museum. 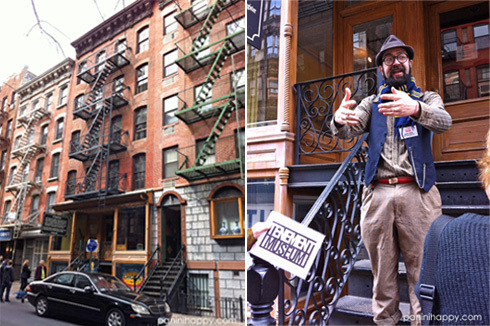 I had read about tenement life, but actually standing inside one was a real eye-opening experience. The apartments were comprised of three small adjoining rooms, with just one window to the outside and no running water. The makeshift kitchen was in the center room, with a hot stove burning year-round (even during the sweltering summers). A woman could be in labor, giving birth to a child in the tiny bedroom, while her husband and associates would be sewing around the clock in the front room to churn out 100 dresses in 10 days for $75. I’m pretty sure I’d heard about The Pickle Guys before visiting the shop on this tour. It’s a good old-fashioned New York City pickle store, owned by Alan Kaufman (whom we had a chance to meet). 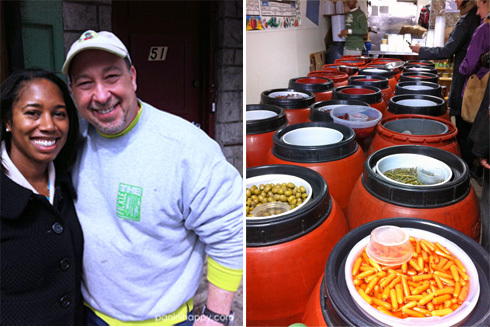 It’s barrels and barrels of pickles as far as the eye can see in the narrow little store on Essex Street. That particular day, in preparation for Passover, one of the guys was out on the sidewalk grinding heaps of a white, fluffy vegetable. Someone on the tour asked the guy what he was making and he responded, “Mashed potatoes!” Ha ha…anyone whose now-clear sinuses were within a few feet of that grinder knew exactly what was in there – horseradish! 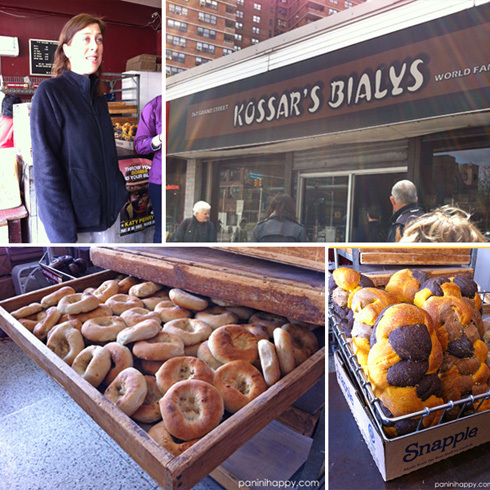 Our last stop before lunch – of course, we’d been grazing all morning – was Kossar’s Bialys, the oldest bialy bakery in the United States. Owner Debra Engelmayer described the laborious process of making bialys, which are similar to a bagel but they’re baked rather than boiled and feature an onion-filled depression in the center. Debra typically makes sixty dozen (!!) bialys on a given day – in the seven minutes that it takes for one batch to bake, she pulls and presses the next batch to go in the oven. Unfortunately, I didn’t get a chance to taste one but they sure looked good (as did those multi-color challahs!). Perhaps it was just as well that I didn’t fill up on bialys…because we needed all the stomach capacity we could muster for our lunch at the iconic Katz’s Delicatessen (you may recall it as where that scene in When Harry Met Sally took place). We took our seats and the food just kept coming – pastrami sandwiches, corned beef sandwiches, hot dogs, knishes, potato latkes, cole slaw, potato salad…did I miss anything? Twist my arm, I sampled a bite of everything. I actually sampled quite a few bites of the pastrami…oh, that pastrami! It was unlike any other pastrami I’ve ever had – 30 day-cured, thick cut, juicy, peppery. I honestly didn’t know pastrami could be that good. 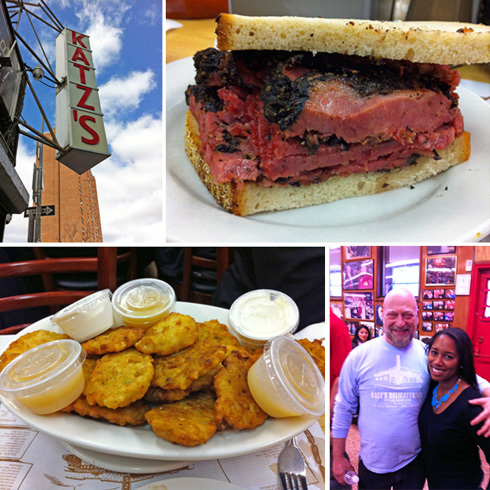 It was also a real treat to meet the owner of Katz’s, Alan Dell, and his son. Whew – and that was all just in my first morning in New York! I had such a terrific time, I wanted to be sure and share some of what I experienced. It’s April so we’ll get on with the business of National Grilled Cheese Month later this week! What an amazing experience you all had. Sounds like you had a fantastic time. What a gorgeous photo of you! How fun! I totally wish I had invested in going to this conference. Next year for sure! Ah, the Lower East Side, my old stomping ground! Looks like you had the grand tour, and such fun, too! Woo, what a feast! And with Ruth, too. Well, if there was ever anybody who could show you every best place to eat in NYC, it would be her, that’s for sure. How fun! Love New York and what cool culinary tour. I’m hungry now. See you when you get home. 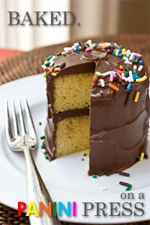 Great recap– I enjoyed reading about your adventures! 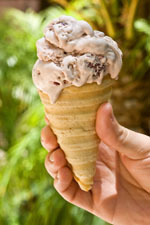 Next post: Grilled Gruyere with Red Onion Confit…plus Q & A with “Cheese Wiz” Gina Freize!